I’ve been really angsty of late, worrying about things I shouldn’t worry about. That’s the life of a Jewish mother, I suppose. But it’s also the life of a social media marketer who is valiantly trying to stay on the right side of the law. The FTC law on sweepstakes rules, that is. No doubt most of you are aware that the FTC (Federal Trade Commission) regulates advertising and marketing practices here in the U.S. They’re the governmental group who has brought us the CAN-SPAM act (email marketing), COPPA (Children’s Online Privacy Protection Act) and, more recently, their Guides Concerning the Use of Endorsements and Testimonials in Advertising, which helped to bring about a more open and transparent level of disclosure by bloggers about their relationships with brands, organizations and events. The FTC is also one of the governmental bodies which regulates Contests and Sweepstakes (others being the Postal Service, the Department of Justice, and regulatory bodies within each of the 50 U.S. states). What’s wrong with this picture? Well, just about everything. This “giveaway” is actually a sweepstakes and, as such, it violates U.S. and state regulations in about a half-dozen ways, not to mention Facebook’s Promotions Guidelines as well. The bigger problem? 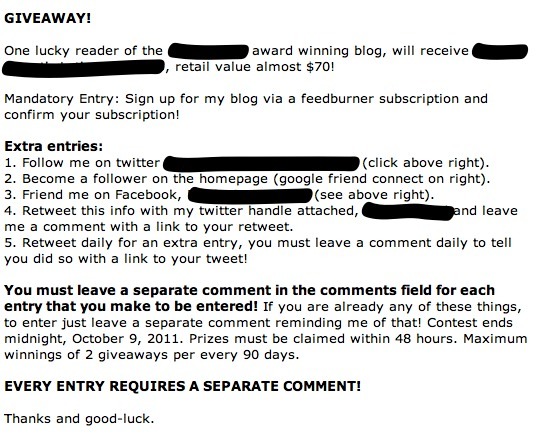 That there are hundreds, if not thousands, of these “giveaways” on blogs each and every day. Don’t you think that at some point the Feds, or one very consumer protection-oriented state (like my own state of New York), are going to sit up and realize that bloggers are mostly doing this wrong? And what’s going to happen to the brands whose stuff is being given away in these “giveaways?” Just as with the Endorsements guidelines, the burden is more likely to be on the brands than the blogger to make sure that every giveaway they are involved with is being run in a manner that complies with federal and state guidelines. A Sweepstakes is a giveaway where winners are chosen at random. A Contest chooses a winner based on some merit: best photo, funniest tip, etc. A Lottery is a prize drawing where people pay money for a chance to win. Lotteries are even more highly regulated and brands (or bloggers) should never run a lottery without strong legal guidance. Thus, most giveaways are actually sweepstakes: a winner is chosen at random based on an entry (like leaving a comment). Sweepstakes prizes valued over $5,000 must be registered and bonded in the State of New York and Florida (so don’t offer prizes over $5,000 unless you have the time and money to register and bond your sweepstakes). All sweepstakes and contests must have Official Rules associated with them, prominently available to the entrant (attorneys I’ve spoken to always prefer that an entrant must check a box to say that they’ve agreed to the Rules, though I’ve also been told that if the rules are prominent enough and verbiage says something like “by entering your name below you are agreeing to the Official Rules” you may be covered. Most of the same rules and requirements apply to contests, with a few additions. If you’re running a contest where you’re collecting any materials from the entrants (photos, essays, artwork, poems), you should state how those materials are to be used and returned (if at all). As well, it may be necessary to restrict photos to images of people over 18 (to stay on the right side of the COPPA laws) and also to state that any inappropriate materials will result in automatic disqualification (be sure to define “inappropriate” for your specific contest). If you are running a contest, there’s another whole discussion your lawyers will want to have about voting for the winner vs. judging the winner. Go ahead, ask them. Double-dare you. It’ll be a long discussion. The upshot: lawyers don’t like voting on contests. So make the final winner selection based at least 60% on judging by an “expert panel” vs. voting by regular people. Or vote for round one, then have the panel pick the winner out of a number of finalists. There’s too much randomness in voting, which makes it a sweeps vs. a contest. Lawyers don’t like it when lines blur like that, you know. I’ve referenced COPPA law a couple of times now, and can’t state emphatically enough how important it is to steer clear of the issues related to marketing to children under 13. However, a few states, such as Maine and California, have recently written new laws governing the collection of personal information for minors under the age of 18. Given that state laws vary on this point, it’s far safer to restrict your sweepstakes or contest to those over 18, and to require proof of age for winners upon certification of the winners. Facebook adds a whole new additional of complexity to promotions with their promotions guidelines. Sara has a good round-up here; the basics on this are that you cannot use any of Facebook’s native applications to enter people into a contest. Native applications include the Wall, the Like button, photos, videos and using Facebook to notify winners. Meaning, in the really bad example above, requiring people to “friend” someone (or “Like” a page) in order to gain an extra entry into the giveaway is not allowed. This is a topic for a whole other post, and many people have already written it, so I’ll just suggest you Google “facebook promotions guidelines” and you’ll get an earful. Or eyeful. In short, “giveaways” are nothing to mess around with casually. 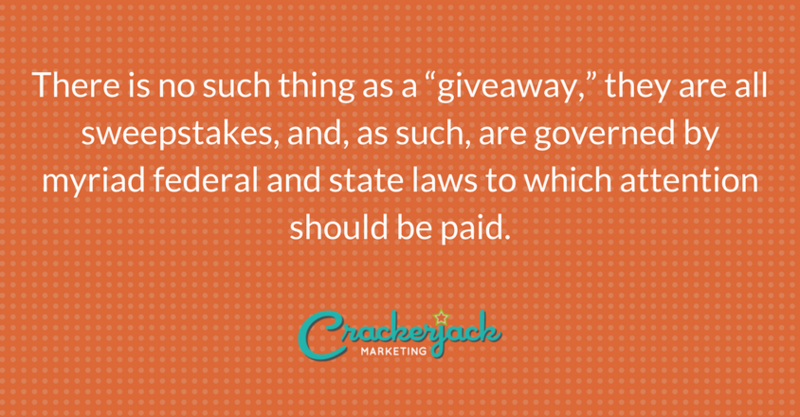 There is no such thing as a “giveaway,” they are all sweepstakes, and, as such, are governed by myriad federal and state laws to which attention should be paid. 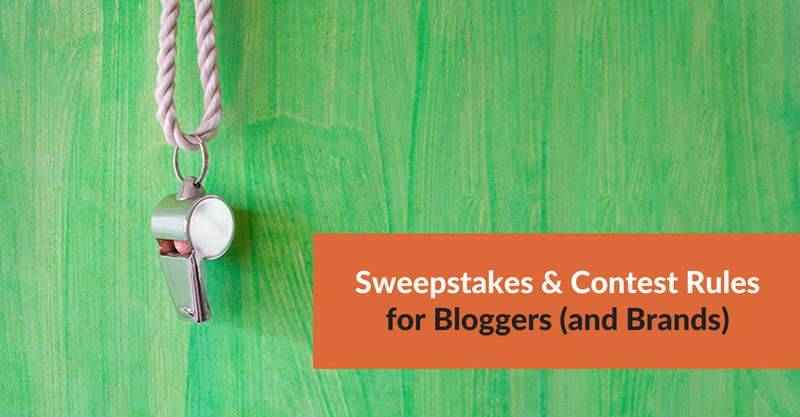 If you’re a blogger who runs giveaways the wrong way, I really hope this post gives you pause: please step back, evaluate, and decide if running the giveaways brings you enough monetary value to either a) hire an attorney to help you setup your giveaways correctly, or b) to fight a lawsuit if a disgruntled non-winner (or winner) decides to take you to task for not following the law. If you’re a brand running giveaways via bloggers, it truly behooves you take control of the situation for yourself, and to sic your attorneys on this matter immediately. Now go forth and giveaway. Properly. This angsty Jewish mother thanks you. DISCLAIMER: I am not an attorney, nor do I play one on TV. The information provided herin is not legal advice and is only based on my own experiences as a marketer with sweepstakes and contests, including counsel I have been given by numerous attorneys over my many years as an internet marketer. None of the above should be considered a substitute for you consulting your own legal counsel who will guide you and your company (or blog) in how to create and manage sweepstakes and contests. This post originally appeared in on Social Media Explorer, where I’m used to be a regular contributor on social media topics.